Is This Tiny Copepod the Key to Sustainably Producing Omega-3s? Laboratory experiments seem to show the crustacean converting cheap yeast into an abundant supply of the healthy long-chain fatty acids. When it comes to their concentration of omega-3 fatty acids, one of the sea’s smallest creatures may pack an outsized nutritional punch. Scientists have just confirmed a surprising characteristic of one species of copepod, a tiny aquatic crustacean, that they say could change the future of fish farming, and perhaps even the human health industry. In the oceans, copepods subsist primarily off algae, and they in turn are a major food source for baby fish and other crustaceans. Nearer to shore, many aquaculture operations feed copepods to young tuna, halibut, lobster, shrimp, and several other species. Because copepods eat omega-3-rich algae, their bodies are plump with the healthy fats, which have been shown to make farmed fish more nutritious and grow bigger more quickly. A team of scientists at Roskilde University in Denmark, however, now says they’ve found one species of copepod that doesn’t need to eat algae to become full of omega-3s. Instead, this species, Apocyclops royi, produces the fatty acid itself by converting the simple fats found in yeast into the coveted omega-3s. They expect their findings to be published early this year. “Yeast is something you can get for less than one kroner, in any grocery store next to the eggs,” van Someren Gréve says. So far, it’s proving to be a low-cost way to produce one of the world’s most coveted nutrients. Just mix with water, feed it sugar, add a few A. royi, and voila, a big batch of omega-3-rich copepods is ready for consumption. The Roskilde team says it was inspired by several studies from Asia that suggested the tropical copepod species could live off yeast. But none of the studies explained how this copepod was sustaining itself on the nutrient-poor food source. Van Someren Gréve and his colleagues raised large quantities of A. royi in their laboratory by feeding them nothing but yeast. Yeast contains short-chain fatty acids, which most animals can convert into very small amounts of the long-chain omega-3s. But it’s unique for any animal to produce enough omega-3s to sustain not only itself, but also the animals that consume it. “It’s not proof, but a strong indication that they are converting short- to long-chain fatty acids,” says van Someren Gréve. To prove that A. royi is converting one type of fatty acid into another will require more detailed tracking of the copepods’ digestive chemistry. If the discovery holds, yeast-fed copepods could transform aquaculture, introducing a much more sustainable and less-expensive source of these healthy fatty acids than the algae-fed copepods currently used as feed, says Betsy Riley, a fisheries policy expert at Michigan State University. “Finding a way to bring down the cost of feeding your copepods, like this yeast might, could be really meaningful,” Riley says. Another beneficial line of research, Riley says, would be to determine if aquaculturists could feed these copepods to adult fish. Typically, copepods are only fed to larval fish (mimicking their wild consumptive habits), while adult fish are fed pellets made from small pelagic fish, such as sardines and anchovies. These fish are pulled from the oceans in huge quantities, and are also used to make omega-3 oils for human consumption. In the sea, pelagic fish are a critical part of the marine food web, consumed by everything from whales to seabirds, and their depletion is a serious ocean conservation issue. Using yeast-fed A. royi for both fish feed and human dietary supplements instead of pelagic fish would prevent further depletion, says van Someren Gréve. The potential of copepods to replace wild-caught fish in human dietary supplements is just beginning to be explored. Leading the way is Norwegian company Calanus, which extracts omega-3s from wild-caught copepods for its products. But unlike A. royi, the copepods caught and processed by Calanus accumulate omega-3s from eating algae rather than producing it themselves. Erica Cirino is a freelance science writer, artist, and wildlife rehabilitator who splits her time between New York and Copenhagen, Denmark. 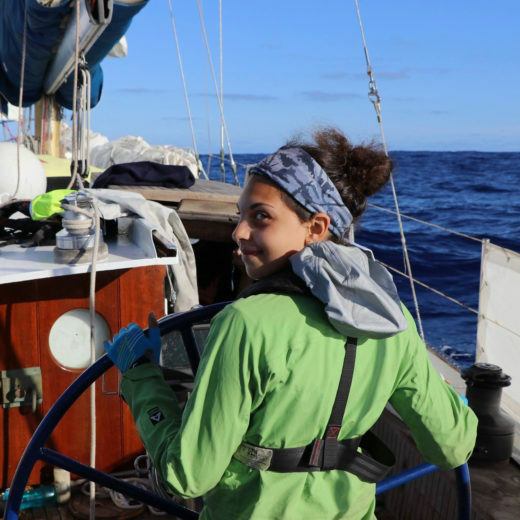 From her bases, she travels the world creating photojournalistic stories about plastic pollution, wildlife, and the oceans—which appear in Scientific American, VICE, Oceans Deeply, and other popular science publications. Erica is most content when diving into or sailing across the ocean. Cite this Article: Erica Cirino “Is This Tiny Copepod the Key to Sustainably Producing Omega-3s?,” Hakai Magazine, Jan 24, 2019, accessed April 26th, 2019, https://www.hakaimagazine.com/news/is-this-tiny-copepod-the-key-to-sustainably-producing-omega-3s/. Ocean warming and acidification are hurting the nutritional value—and the taste—of some seafood.